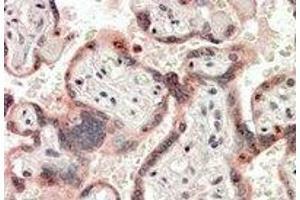 Immunohistochemistry: CRIPTO Antibody staining of Paraffin Embedded Human Placenta at 3.8 µg/ml. Steamed antigen retrieval with citrate buffer pH 6, AP-staining. Cross-Reactivity (Details) Species reactivity (expected):Mouse, Rat, Canine (Dog), Bovine. Application Notes Peptide ELISA: Detection Limit: 1/128000. Western blot: Preliminary experiments in Human Umbilical Cord lysates and in lysates ofcell lines HEK293 and NIH3T3 gave no specific signal but low background (at antibodyconcentration up to 2 μg/mL). Immunohistochemistry: 3-5 μg/mLIn paraffin embedded Human Placenta shows stainng assocated with nuclei in sometrophoblasts and weak cytoplasm staining in cytotrophoblasts.